The other day, I mentioned cooking a few things from Jamie's Italy and then went on to mention a black bean mango salad and a meal in San Antonio before finishing the story. After making the farro salad, I found a couple of other items to try. The funghi al forno ripieni di ricotta became the first course before the spaghetti alla trapanese. The stuffed mushrooms were filled with ricotta mixed with oregano, lemon zest, parmigianno reggiano, and finely chopped red chile. It was so simple but a little different than a usual stuffed mushroom. The lemon and chile were great accents to the smooth, mild ricotta. 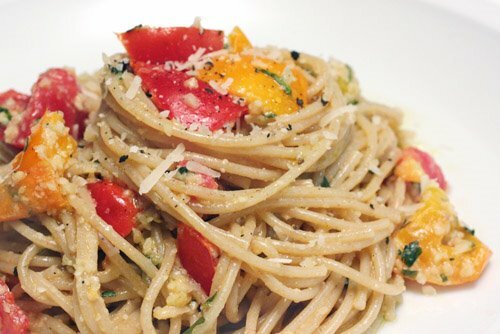 The spaghetti couldn’t have been easier to prepare, and if you have homegrown or locally grown tomatoes, this dish highlights them perfectly. The sauce is a raw pesto of sorts to which chopped tomatoes are added. Because they’re not cooked at all, the dish is really all about the freshness and flavor of the tomatoes. This was a fun meal to make, and as noted in the recipe, the prep work can easily be finished while the pasta water boils. Jamie also notes that he prefers cherry tomatoes for this, but any good, ripe tomatoes will work fine. I used a food processor, but a mortar and pestle are recommended. I’ve always heard resulting textures are better with a mortar and pestle, but I’ve never had the patience to try it. So, while the pasta water was brought up to a boil, almonds were chopped to a coarse, powdery consistency in a food processor. That was placed in a large mixing bowl, and then garlic and basil were chopped in the food processor and added to the ground almonds. Parmigiano reggiano was grated and added to the other ingredients, and olive oil and salt and pepper joined all of that. Last, one and a half pounds of tomatoes were chopped, placed in the bowl, and then they were squished and smooshed to break them up and release their juices. The pasta was cooked, drained, and placed in the bowl. While stirring the sauce into the pasta, a little more olive oil was added. The ingredients don’t actually form a proper pesto. The amount of olive oil was not as much as that needed for pesto, and the tomatoes provided most of the sauce liquid. Instead, the ground almonds added mild, nutty flavor and substance to a basil- and garlic-inflected sauce that was really a vehicle for juicy, ripe summer tomatoes. I pulled this out of the refrigerator for lunch the next day and was faced with a dilemma. I didn’t think the sauce on cold pasta would be as good but I also knew that heating the tomatoes and basil would be disappointing. I went with a half-way approach to re-heating. I got it just warm enough to loosen the olive oil on the pasta but not so much that the tomatoes would start to cook. It was still good, enjoyable, certainly not a bad lunch. However, it simply could not compare to the range of textures and bursting-forth tomato flavor it had when first made. Looks and sounds amazing! I wish I can get really juicy and sweet tomatoes here. The ones sold at the local supermarkets are often very sour. This does look rustic and yummy. The Cooks Illustrated version I made the other day had the same ingredients but was more like an actual pesto. Everything was wizzed-up in the food processor. It also included a single seeded pepperoncini which added nice heat and tang. What lovely lovely pasta. I know I said this after the farro post, but I really need to pay more attention to that book. The pasta dish with chickpeas and rosemary is a go-to one for me. Woohoo for easy pasta dishes!!! I love tomatoes, too. That looks good right about now. the pasta looks fantastic. It reminds me of a pasta I ate ages ago that also had an insane amount of garlic. This is a beautiful pasta dish. So nice in the summer with veggies in season. I feel like Im in Italy :-) everything here looks irresistibly delicious! Truly delicious pasta and it's making me crave for it now. The stuffed mushrooms look just wonderful too. What a great meal. That looks just perfect, especially for this hot and humid weather we're having! Not at all in the mood for anything heavy, so I thank you! More and more, I'm pulling away from saucy tomato or cream sauces and favoring the just-moist texture of pestos. With the tomatoes, this sauce is a happy medium and makes an absolutely delicious looking pasta! I love your use of both red and yellow tomatoes for vivid color. The trick here is not to fill up with those scrumptious stuffed mushrooms first! Oh it looks gorgeous! But it will be lovelier in my mouth, right now! I am SOOO hungry looking at that right now! Beautiful looking pasta! The fresh tomato flavor sounds really nice! I think I am going to make this tonight! Thanks Lisa! holy pasta dish, batman! what lovely colors and ingredients--this ground almond business sounds like a wonderful component. The colors and the crunch here...wow is all I can say! So nicely done Lisa! We will not try to pronounce that, but we will try to eat it. Nice pasta...very different from the usual ones...looks really yummie, very tasty. That looks so good! Reminds me of the mushroom pasta we had at a conference in Wisconsin! The mushrooms look amazing. I love the chopped chile idea! The mushrooms sound incredibly delicious stuffed with Ricotta. And the pasta has a light, fresh, summery feel to it that I love. 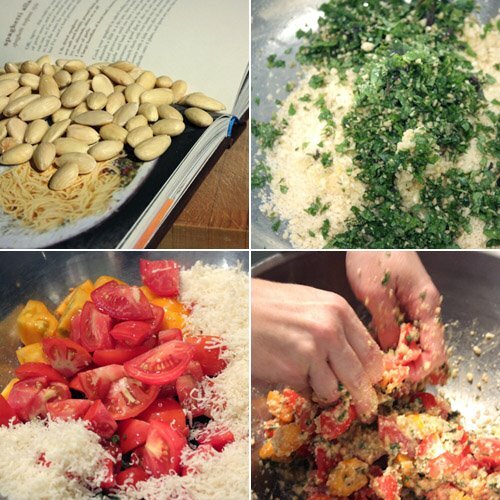 I have not tried these 2 recipes from Jamie's italy. I am not tempted after looking at your pics. 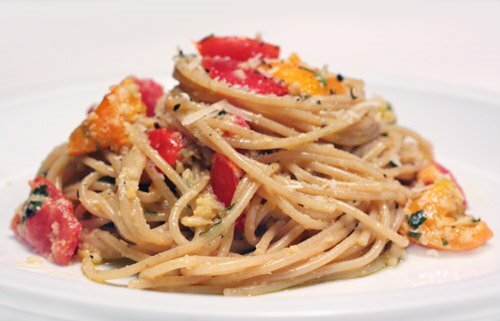 A very well-composed pasta dish and the pics are vivid! 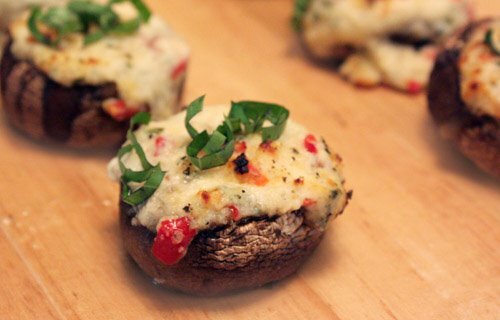 That is a great take on stuffed mushrooms. I haven't made any in ages. The pasta looks great too, of course! Oh my good, I'm italian and I've never tried this! I need to make up now, I'll make this spaghetti this evening, they look amazing.